What does it mean to major in biochemistry? Students who major in biochemistry investigate the detailed chemistry of the life process. There are two paths to study biochemistry: B.A. in Biochemistry or the B.S. in Chemistry with an emphasis in biochemistry. The B.S. degree provides a more rigorous math and science curriculum with opportunities for significant research experience. Students build a strong background in the concepts as well as computational and laboratory techniques used in biochemistry. To enroll in either program, students must have successfully completed Chem 105 or be eligible to register for Chem 105, which requires a minimum ACT mathematics score of 25 (SAT 580 or SATR 600). The biochemistry curriculum follows the recommendations of the American Society for Biochemistry and Molecular Biology (ASBMB), and focuses on the composition, properties, and reactions of biological substances while students gain enhanced reasoning and problem solving skills. 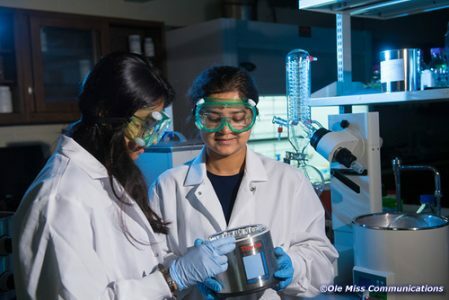 Why is the University of Mississippi a good place to study biochemistry? 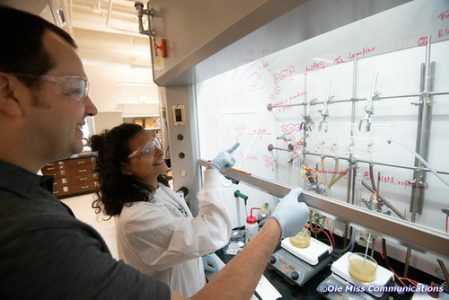 There are 26 faculty in the Department of Chemistry and Biochemistry with areas of expertise in analytical, biochemical, computational, electrochemical, environmental, forensic, inorganic, organic, physical, and theoretical chemistry. The four biochemists have a variety of research interests, including stability, calcium binding, dimerization of cadherins; DNA binding protein structure and function; metalloprotein design, enzymatic fuel cells, bio-inspired C-H activation, self-assembly, and foldamers for novel structures & functions. The department is ranked in the top 50 (out of 555) chemistry departments in the U.S. for its production of undergraduate degrees in part because faculty members take a keen interest in the success of their students. They provide expert career advising and plenty of individual attention. Students may become involved in research with faculty members as early as the end of their freshman year, and many opportunities exist for students to become involved in funded summer research projects. It is not unusual for a biochemistry major to co-author a scientific article with a professor before graduating from UM. The Student Affiliates of the American Chemical Society provides a social setting for the exchange of ideas among students in the chemical sciences, arrange field trips to industry sites, and organize transportation to regional meetings of the American Chemical Society. 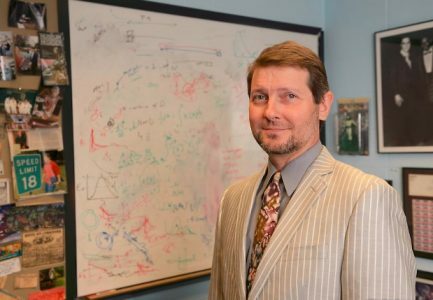 Dr. Randy Wadkins, Professor of Chemistry and Biochemistry, earned his Ph.D. at the University of Mississippi and held postdoctoral positions at the Max Planck Institute, St. Jude Children’s Hospital, and the Naval Research Laboratory. He was also on the faculty of oncology at the Johns Hopkins School of Medicine before joining the faculty at UM. His research interests include biophysical chemistry, molecular dynamics, fluorescence microscopy and imaging, DNA structure and structural transitions, and biosensors. Dr. Wadkins spent the 2015-16 academic year working on Capitol Hill as the Biophysical Society’s inaugural Congressional Fellow as part of the American Academy for the Advancement of Science. He participated in a yearlong seminar series on issues related to science policy and funding. What can biochemistry majors do after graduation? A liberal arts education empowers and prepares students to deal with complexity and change through a broad knowledge of the world. They gain key skills in communication, problem-solving, and working with a diverse group of people. Related careers in biochemistry include health care, medical research, pharmacology, toxicology, public health, pharmacy, law, and policy. Andrew worked for several years on a novel synthetic compound to treat cancer at the genetic level and presented his research at the American Chemical Society national convention. He was also a researcher in the Department of Pharmacognosy, Department of Surgery (at UMMC), and MS Center for Contextual Psychology. 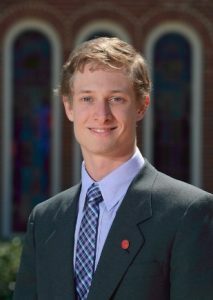 He received the MS Associated Press Broadcast Award for the Best College Newscast, was a member of the Men’s Chorus and Oxford Civic Chorus, VP for Alpha Epsilon Delta (pre-med honor society), and Outreach Chair for the Student Member of American Chemical Society from which he won the Biochemistry Award. He was inducted into Phi Kappa Phi. After graduating, Andrew enrolled in medical school at the Pennsylvania State University College of Medicine where he served as Class Vice President and President, and earned an MBA. He is beginning a residency in psychiatry at Northwestern University. Dr. Matrick’s goal is to practice psychiatry while taking an increasing administrative role in the healthcare system, especially behavioral health. Whom should I contact to learn more about majoring in biochemistry?